Remote sensing is a method of gathering information about an area, an object or a phenomenon without being on-site. 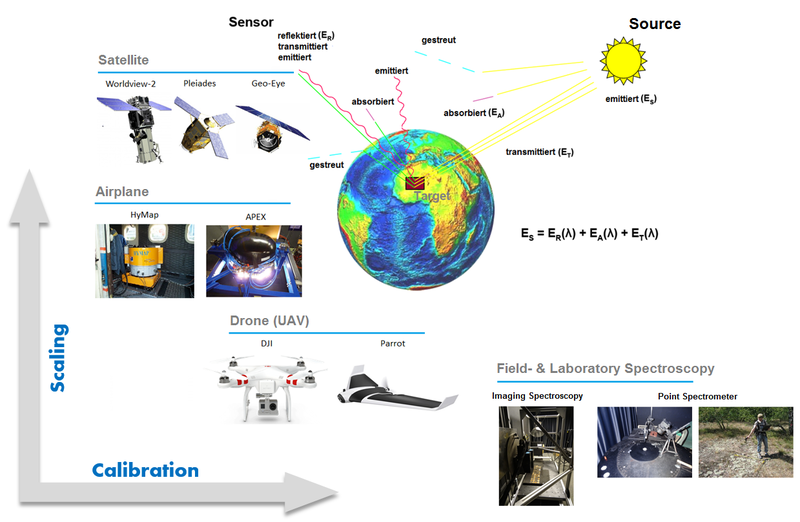 For this purpose, sensors on satellites, on airplanes or even on UAVs (drones) are used to detect reflected solar radiation (optical sensors), emitted earth radiation (thermal sensors) or actively emitted electromagnetic radiation (laser or radar). In this process images are taken in a broad spectral range of radiation, both visible and invisible to humans. The spectral information is rather complex; after taken it has to be processed and then afterwards be validated in field studies. One needs experts and a good basis of data to create a classification of habitats or even detect the occurrence of species from different spectral signatures. Once this work has been done, remote sensing is an effective and economical method, in particular to monitor the state of protected areas without interference.